Learn all about gold and the Australian gold rush during a one-hour tour of the Perth Mint. 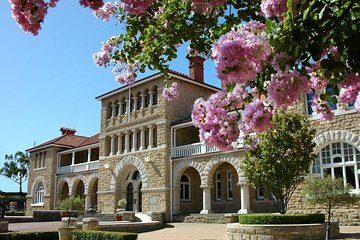 One of Western Australia’s oldest heritage sites, the Perth Mint features multimedia presentations, historic images and artifacts, and a dazzling array of pure gold that includes natural gold nuggets and a solid gold bar. Make your own way to the Perth Mint to meet your guide for the tour. Hear about the history of the grand heritage building, which includes heavily secured vaults and the original melting house. View the largest coin ever made; have the chance to handle more than $700,000 worth of gold bullion; and watch molten gold being poured to form a solid gold bar. See Australia's most dazzling collection of natural nuggets, including Newmont's Normandy Nugget, the second largest gold nugget in existence, which weighs 56.2 pounds (25.5 kilos). You'll also learn about the lives of early gold prospectors who often spent years in the harsh conditions of the Australian outback in search of gold. Very informative tour. Jarrad was knowledgeable, happy to answer questions and we enjoyed his humour. We took our grandchildren who were very impressed after seeing the moulten gold poured. Good value. The gold pour was the most interesting. Don't forget to get yourself an engraved coin to celebrate any occasion! I've never been to a mint before and I am glad that my first visit to a mint was so informative. I loved the gold pouring demonstration. They had some fun activities like holding a gold bar, measuring your worth with the current gold price or decorating your own coin. This place is nice place to visit. There is a lot of really nice things in there and the tour was good . Great tour not only covering history, see a ton of gol, lift a gold bar and gold pouring but we got to found out what were worth if were worth our weight in gold.